My take is that this is a fantastic “down and dirty” survey; good job. 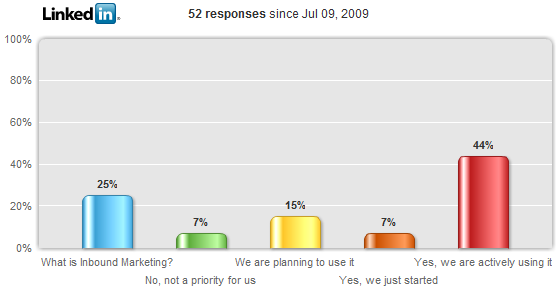 I hope you keep it running so you can re-publish the results at the Inbound Marketing Summit this fall with more respondents. Hi Dale, unfortunately I have to pay LinkedIn 50 cents per answer. That is the only way I can randomly select the respondents (I selected people in Marketing in 4 tech-related industries). 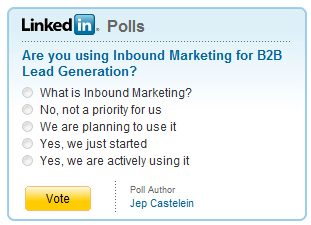 I can promote the poll with my readership for free, but then the answers would be biased towards the blog-reading B2B marketer (who tends to be more innovative).